Whether you are single or choosing to travel alone, in:spa retreats have been very popular with solo travellers for over 10 years. Approximately 70% of guests on all our retreats come on their own (most of whom are female) and are made to feel immediately comfortable on arrival by our friendly, expert team of personal trainers, yoga teachers, chefs, nutritionists, and massage therapists. Plus, of course, the retreat host. With the number of guests strictly limited (up to 24), the team create a relaxed, informal house party atmosphere which our guests seem to love – particularly as around 40% of guests on every retreat have been on an in:spa retreat before. All meals are held in a communal dining room (generally just one or two tables) and it’s therefore easy to get to know your fellow travellers in an unpressurised way. 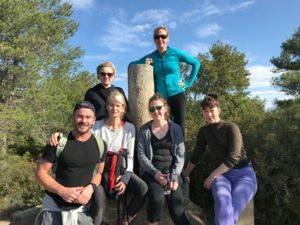 Everyone also takes part in fantastic hikes in the beautiful surrounding countryside, and enjoys daily yoga and fitness classes together. But you are not forced to be in a group all the time. There’s plenty of opportunity to find a quiet spot in the gardens with your book or sunbathe beside the swimming pool. Whether you choose to join one of our retreats in the foothills of the Atlas Mountains (30 minutes from Marrakech) or at our private chateau in southern France or at our magnificent private residence in Mallorca, you will find yourself in a calm oasis, surrounded by spectacular scenery. All guests have the same objective for the week: to experience and benefit from an award winning health, fitness and detox week and to return home looking and feeling amazing! Click to find out more about the in:spa programme, a sample menu, our expert team and forthcoming dates and destinations, visit our destinations page.